Bananas + brown butter ghee + chocolate = yummmmmmmmm. 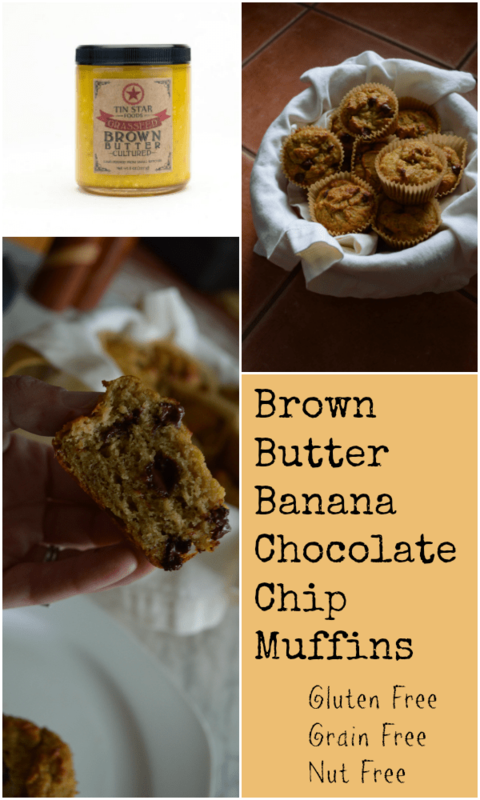 Yes, that’s a mathematical equation and this recipe for brown butter banana chocolate chip muffins is its proof! I had a few overripe bananas and wasn’t feeling inspired by my usual paleo banana bread recipe and craving something even more dessert-like so I thought I’d experiment with turning them into sweet muffins. Like many with Crohn’s disease, I don’t do well with a lot of lactose containing dairy, but Tin Star cultured ghee is both lactose and casein free. Ghee is a paleo food staple these days, but the stuff from Tin Star is special, particularly the Brown Butter Ghee which is made by gently allowing the milk solids to toast over an open flame, so the nutty flavor profile emerges. This nutty flavor is especially welcome in gluten free baked goods like this one that don’t contain actual nuts! You can get both varieties of Tin Star ghee from several sources, including Barefoot Provisions and on Amazon. While people with autoimmune diseases are encouraged to avoid all dairy as part of an initial elimination diet, it is a good idea to try reintroducing ghee because it is packed with vitamins like Butyric acid, Vitamin K2, A, E, CLA and medium chain fatty acids – all of which are important for health and taming the immune system. The process of turning butter into ghee renders it free of both lactose and casein. Eggs: If you are unable to tolerate eggs, you could substitute two “gelatin eggs.” The muffins will be gummy while warm, but will cool to a nice texture. Dairy: Many people are able to reintroduce ghee, even if they don’t tolerate other forms of dairy, but if you don’t you can use 1/4 cup coconut oil instead. It won’t have that nutty butter flavor, but will still be tasty. Brown butter ghee gives these grain free muffins a nutty flavor without the nuts! Preheat oven to 350 degrees. Prepare 12 muffin tins by greasing or lining with paper muffin liners. By hand or in an electric mixer, combine bananas, honey, eggs, ghee, and vanilla. In a separate bowl, whisk together the coconut flour, tapioca starch, baking soda, baking powder, salt, and cinnamon. Combine wet and dry ingredients and mix in chips. Bake 20-25 minutes or until top is lightly brown and muffin springs back when lightly pressed. 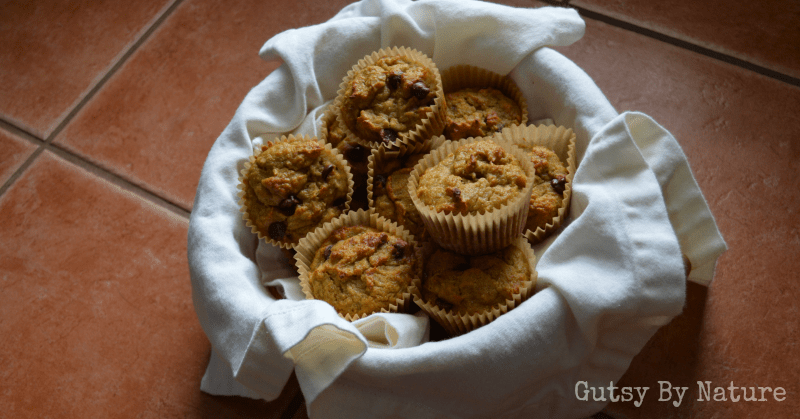 What a great recipe:-) I made it this morning and they were the best gluten free muffins I have tasted for a very long time! Thanks for sharing! I’m so glad you liked it! The brown butter ghee really makes them, doesn’t it?